1)I found out that I play in some absurd time signatures! 2)I also figured out the it is nice to be able to record the part as MIDI, tweak the missed notes and then turn it into audio. This also gives a visual clue as to what I played and when as this is all original creation. The piano roll comes in super handy! Good thing Logic allows for time signature changes. I don’t think there is a DAW on iOS that allows for multiple time signatures. Please leave me a note below if you know of one that does. 3)I also used Logics Drummer feature and it followed the different time signatures flawlessly. Very cool! 4)I had to turn Equator sounds DOWN so they wouldn’t distort. Equator was just simply overloading it’s own output. I’m not sure why when I’m dealing with stock sounds. 5)The level of control and nuance available when playing the SeaBoard Blocks is insane! It really is awesome! 6)I also found out that SoundCloud really has issues with it’s iOS app. You are further ahead just to use Safari and access the website. Anyways… if you are inclined to listen… it’s a work in progress and is super short. Got creative with your music apps and now you want to share it with the world? How about putting it in YouTube as a music Video? Enter Wizibil – the quick and fun way to create a video to go along with your music. Then share that to AudioShare and then bump it that out to Wizibil. Select your theme, dump in some pictures and type your info in. Export to YouTube and share with the world! You are going to have a concert, I feel it is the season! So, how are you going to record it and listen/watch to it later with your students? This is part of the National Standards for Music – Evaluate music. This gives you and your students a chance to sit back and enjoy the hard work and effort you have put into the performance. I had a concert tonight with my electronic group that is fused with traditional instruments. I have a couple of Christmas concerts coming up soon as well. I wanted recordings so I actually remembered to hit the record button a few different ways tonight! First of all I went basic – quick and easy… I had my daughter use my iPhone and she recorded video. Boom…. instant go back to class tomorrow and watch it as well as hear it! Secondly I went for easy but a step up in sound…. we stuck a handheld recorder in the front row of the audience. Now we have stereo sound not just the mono iPhone mic. Thirdly we used our digital sound board and captured 16 tracks of digital audio right from the electronic instruments and microphones. Here is a picture of the handheld recorders I used…. Then I took that SD card, stuck it into my computer and used an app called Final Vinyl, much like Audacity, to open the entire concert. Once opened in Final Vinyl it was VERY quick and simple to divide each song, take out the in between stuff and export the four songs into iTunes. Here is what that looked like when I opened it at first…. Then I marked each piece start and end. That one long file quickly got turned into these four Aiff files you see to the left. Of course the PreSonus StudioLive sound board we use allows us to easily record 16 tracks of digital audio right straight from the sound board into my MacBook. 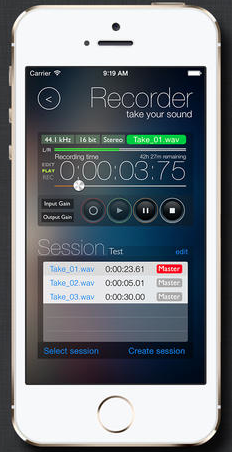 PreSonus has a nifty, straight forward app called Capture that is FAST to open and create a new recording. Then almost instantly you are recording all inputs from the board PLUS a stereo track of the main mix. Of course THAT audio has to be taken into a DAW and sliced up into the individual songs. Then it has to be mixed into a final recording. Of course along the way you can edit each individual track, apply EQ, Effects, Compression and all sorts of digital audio magic… it’s a raw 16 track recording! It’s beautiful! Of course it’s also a LOT more time consuming and takes extra steps to end up with your final product BUT the sound quality will be WAY better than anything you will ever hear from a handheld recorder, iPhone or video camera. Here is what the concert looked like in Capture, all 16 + 2 tracks of digital audio straight recorded from the live sound…. Now I just gotta go find time to open THAT up in StudioOne or LogicProX and mix it, edit it and spice it up! 🙂 Such fun…. stuff that just a few short years ago would have required a professional studio and a WHOLE lot more equipment to be able to handle. 1)Do you want Fast, Easy, and Quick with pretty decent sound AND video? – iPhone videos are pretty decent these days! COST – probably in your pocket? 3)Do you want to really do it up? Buy a digital board like the PreSonus StudioLive or RackMount Series. SOUNDBOARD/INTERFACE – for 16 tracks starts at $900, for 32 tracks starts at $1,800 – You can even get 48 or 64 tracks too! COMPUTER – Yup, you are gonna need a computer for this too. What’s to think about it’s free! 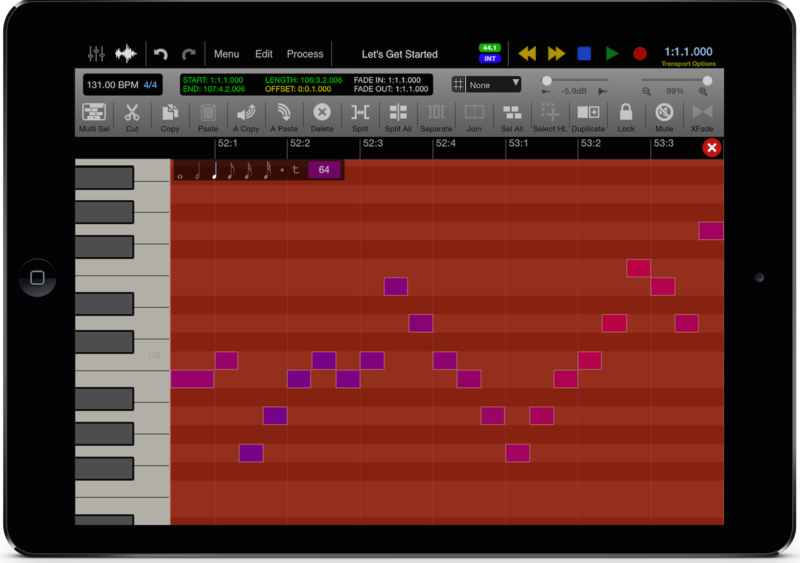 Go get it – Especially if you haven’t bought yourself an app that does the the whole digital audio workstation bit yet! Plus their BeatPad is on sale for $2.99 (down from $5.99). BeatPad and PocketStudio work hand in hand. Pass your beats you create in BeatPad off to PocketStudio then record your keys, vocal and guitar into PocketStudio. Don’t forget to add some live horns in there too! 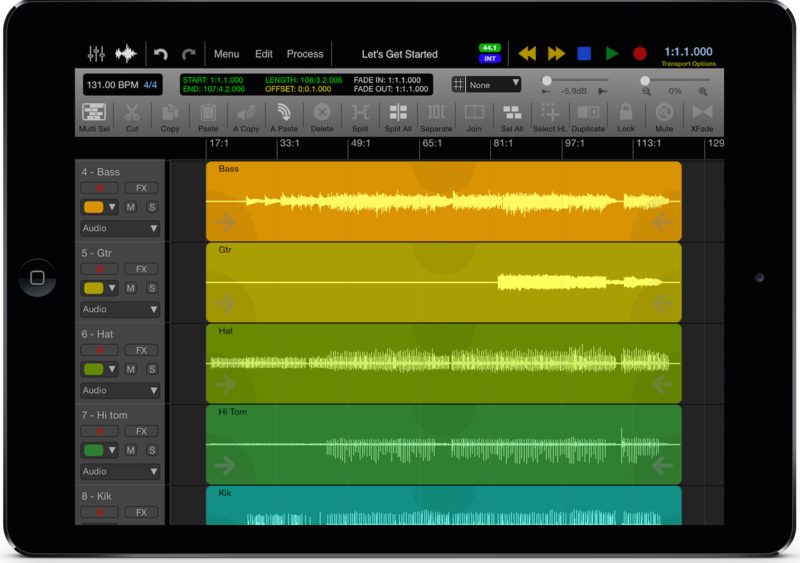 Pocket Studio by XME here is a list of top features to tempt you even more…. 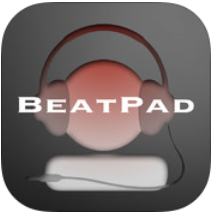 • BeatPad midi plugin: Tap the folder icon/new/track/midi then tap the Midi Track’s input button to select BeatPad. 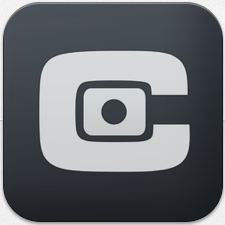 Capture for iPad Arrives – Drop Dead Simple App to Record With! 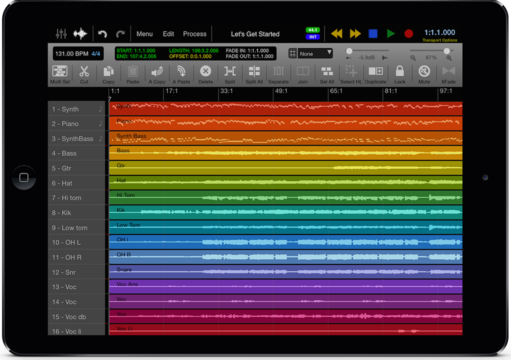 Presonus released a new app recently that has high potential to make things simpler for us musicians. If you are a music teacher who needs to create accompaniment tracks for your students or if you ever record your performances this app would be an awesome choice. In fact, there are only two items missing from this app that would make it stand at the top of the list of iPad DAW’s – more about those two wish list items at the end. 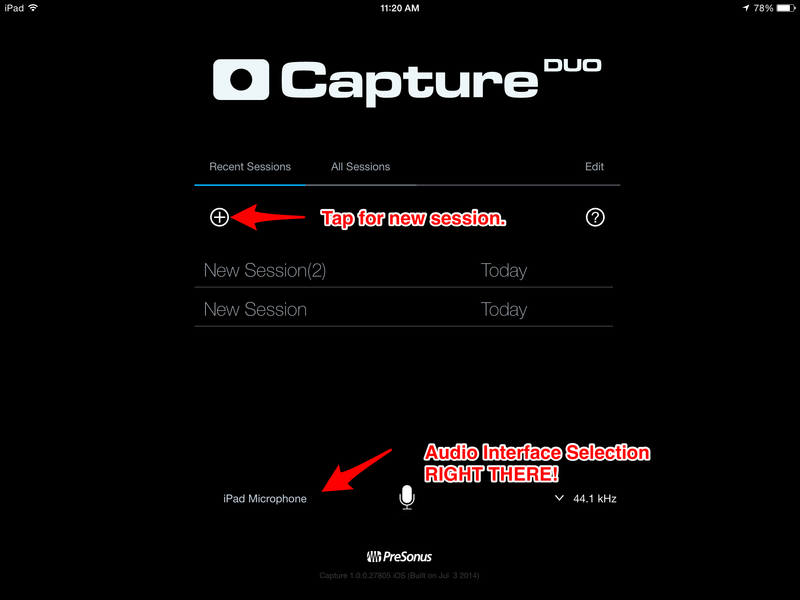 WHAT CAPTURE IS: The purpose of this app currently is simple – it gives you a super simple way to record with your iPad. Capture gives you a mobile recording studio that you can then take back to the computer and edit further. WHAT CAPTURE ISN’T: It is NOT a recording app to record from other iPad apps. The app is called PreSonus Capture and it comes in two flavors – the FREE Version ( PreSonus Capture Duo) and the $9.99 Version ( Presonus Capture). The only difference between the two is how many tracks you can record – free=2 tracks, not free=32 tracks! This pricing structure is a like getting a present at Christmas! – by offering you the free version, PreSonus has just given you a way to get those simple, straightforward recordings you need. For instance, Choir Teachers always need accompaniment tracks, Band Directors always need accompaniment tracks and we would all like to be able to record ourselves playing or singing our music. Now we have a great looking, simple and mobile solution that is free. The app is very straightforward to use. 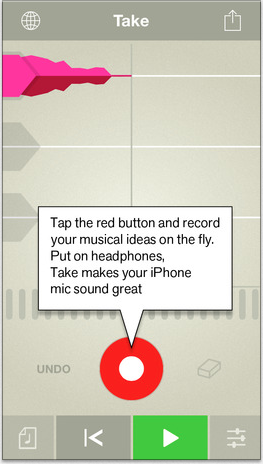 Start it up, start a new session, select whether or not you want to monitor what you are recording in the headphones, tap the record button and start the music. Take a look…. One technique they have used for this app is to make it very easy to select the interface you want to use. 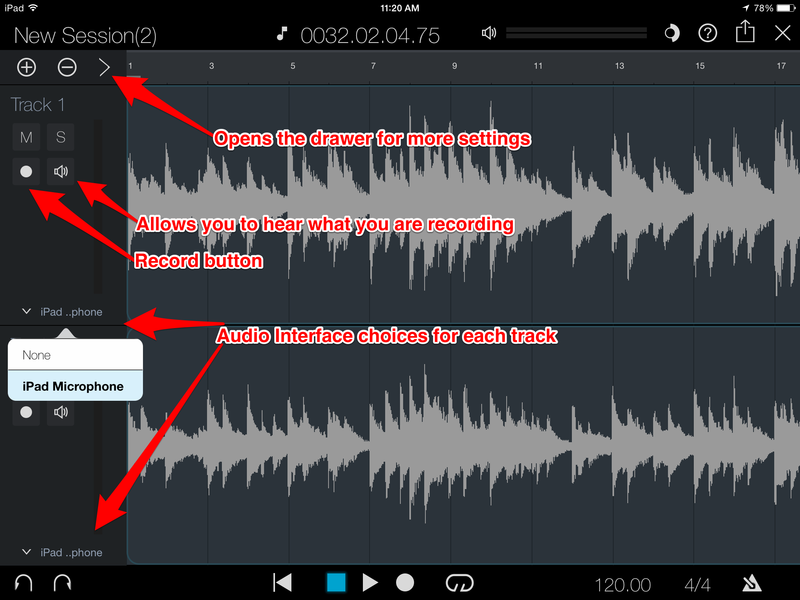 The app works with the built-in mic and it also works with audio interfaces like the newly released (but not available yet) PreSonus AudioBox iOne or the iTwo or any other MFi iPad interface. I used it with my Line6 SonicPort just fine. Trying to find this interface selection in other apps and on the desktop is always a huge search, even for me! It is also imperative that I was able to adjust my stereo/mono settings. It really annoys me when I record my keyboard and it is not in stereo. With the Capture Duo app it was easy, tap the single dot at the bottom of the input meter which will then become two dots indicating that you are now recording in stereo! Here’s a picture of that…. Adjusting and editing the audio was very easy. Just do what seems to be the right multi-touch gesture and you are probably going to be in business. Tap to select, double tap to bring up a menu to Cut/Copy/Delete/Duplicate/Split at Cursor or tap then hold for a second then drag the audio to a new location. PreSonus has been very focused with the purpose for this app currently – A mobile recording solution to use in conjunction with other software that is easy to use. If you use it with Studio One it is even easier to work with your recordings because they will transfer wirelessly right into the desktop software! I believe they hit the mark right on. I can not wait to see where this app is a year from now! This app does not have to be used with Studio One on a desktop. Studio One is free though for Mac and PC both- PAY ATTENTION ALL OF YOU WHO USE THAT OTHER FREE RECORDING APP! Go download Studio One, it’s free! WISH ONE – With that being said, I really wish there were other ways to share your recordings from within Capture – Using the Open In option or to upload to SoundCloud or DropBox or even Box.net. WISH TWO – The app REALLY, REALLY, REALLY needs to get audioBus integration so we can use it to record other iPad apps! This would open up a HUGE open door! (I suppose InterApp Audio would help too.) There is a huge number of iPad Musicians who are using the iPad and apps as a very real way of making music! What used to have to be done in professional studios, on equipment that cost thousands of dollars, is now being done with apps and an iPad. If you use one of the new AudioBox Interfaces – the iOne or iTwo you will have to have the interface plugged into the iPad power adaptor. As always – the links in this post are affiliate links. That means that if I inspire you to purchase any of the apps/music that I link to in this post I receive a small portion of that sales – something like 5% I think. This comes out of Apple’s share and the developer keeps their portion of the sales. It’s just a small way to inspire me to keep writing and sharing my ideas, thoughts and tech finding with you all. Well, I wrote about the future having arrived a few days ago when I wrote about NotateMe. I wasn’t kidding either and apparently a LOT of other people were very intrigued as well! Thanks for reading that post about the transformation from NEEDING a computer to being able to work ONLY with a mobile device in music. Now let’s talk about the future of LEARNING how to play a piece of music. For thousands of years people have relied on learning how to play music by listening to it – they repeated sections of the piece over and over, repeating what someone played for them. Simple call and response, over and over. When learning someone else’s music this tradition has not died even now. Now though, it is going to be a whole lot easier! If you have EVER worked on figuring out a song by ear you know how many hours it takes us! (OK, well at least me a few thousand others who are not blessed with the ability to play anything we hear by hear!) This app is going to save you hours! Capo has been out for a while now on a normal computer and is now up to version 3! Now Capo Touch available for those using iOS mobile devices! In fact currently both the desktop version and the mobile versions are on 50% sale! So the time to buy them is now! Let’s talk about what Capo is since most of us don’t know…. Automatic Chord detection – it will TELL you the chords for any song in your iTunes library! Doc Brown would have hated us having this tool available back when we were taking Ear Training and Music Theory back in college! Slows Your Music – High quality time stretching engine that will slow that music down to a learnable pace! Looping Regions – Play it again Sam! Over and over, slower if you like, until you get it! Transposition – Now we can instantly change the key of the song! Chord Boxes – For those of you who are guitar players (or teach guitarists) Capo will show you how to play those chords it has automatically detected AND if you transpose the song it transposes those chord boxes too! Metronome, Count-Off, and Effects – Not sure where that beat is? Well turn the metronome on silly! Beautiful Interface – Gives you a great experience browsing you music library to pick that next song to learn. iCloud Syncing – Work on you iPhone while out and about and then when you pull out your iPad later everything will be in sync. Of course, since Capo is also available on a normal computer it syncs there as well! There is at least one difference between the desktop version of Capo and the mobile. On the desktop version you are able to actually draw in notes on top of the spectrograph, just like you would in a piano roll on a MIDI sequencer. Then, after drawing those notes out, you will actually get TABS so that you can learn the part on your guitar. I am impressed at all of the pro musicians they have who are backing this app too! Go ahead, click that picture below and read everything they are saying about it! Pretty cool. These are not just some ol’ teacher like me – these are people getting paid good money for the music they make! The app currently has tabs, chords, and chord diagrams for guitarists. Which is awesome but I would love to see the ability to have music notation instead of tabs! Even if I could export what I have done in Capo as an XML file to use in Sibelius or another notation app it would be awesome. I currently am using Capo2 and the export function does not work very well – OK, actually I could never get it to do anything – UNTIL I imported the MIDI file into Sibelius. Once it imported into Sibelius I was able to see the notes I had drawn in. Of course it was not performance ready but it would give us non-guitar players something to look at that would be better than tabs. Now, if it would just export the chords as well! Maybe the export functions are better in Capo3? If someone has v3 and could let me know it would be awesome! If you are ever in need of an app to help you figure out how to play a song that you do not already have music for this is it! In fact, this answers one of my issues I have with my own music – I play and record then I forget what I played and recorded! This app helps me solve that issue! Usually, I am composing in a DAW, like Cubasis or Logic and using audio recordings. Before this app there was no way for me to turn that audio back into any sort of notation to help me remember what in the world I played! Now, problem solved! If you are a teacher, a performer, or an amateur musician, you would be crazy not to grab at least one of these if not both of them! Remember – if you are inspired to purchase apps because of my blog, please click on my links and help give back to my efforts here. Each link is an affiliate link and gives me a small percentage of Apple’s profit on each app. The developer still gets their full profit. Musicians always have the desire to record our music, be it our own or that music we are listening to around us. They also have longed for a way to quickly capture musical thoughts and ideas that pop into our heads. Usually these ideas pop into our heads at the most inopportune times – on the train on the way to work, at work during lunch break, or maybe waiting in line. How do we capture those ideas quickly with a minimum of fuss? Have you ever used Apple’s Voice Memos app because it is so straightforward and drop dead simple to use? Then you also were probably left with a desire for that app to offer just a little bit more! This is going to be a simple and straightforward post about a few apps that are great options to simply record. 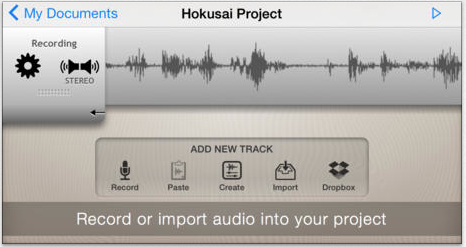 We are not talking about apps like GarageBand and Cubasis, nope, just apps that let you record quickly and easily. They let you record one or more tracks, do a few basic edits and maybe have a few other “extras” like adding reverb or sharing. 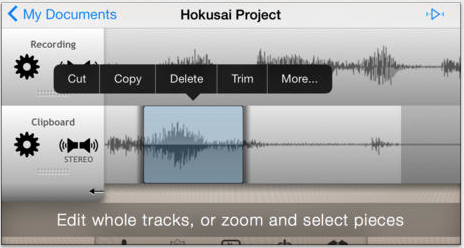 I love the way Hokusai allows you to interact with the audio on a touch interface. 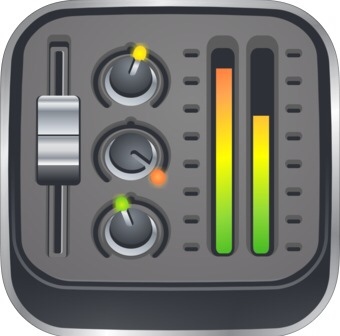 This app allows you to do multitrack recording and also allows you to edit that audio – trim the ends, cut, copy, paste, delete and you even have some filters and special effects! You can transfer the edited audio via USB, DropBox or use the Open In option to send to other apps. Takes the drop-dead simplicity of your voice memos and combines to with features custom tailored to vocalists (Or any musician, in my opinion) Propellerhead has released a wonderful app today that allows you to start recording right away, with the tap of just one button! But it gives you just a few more options as well. There are three parts per song you can record, allowing for some harmonies or an instrumental track. There is the all important metronome too! This metronome is not Beethoven’s metronome though, it has some fun loops and beats to get you inspired to musical greatness. Then there are even some basic effects controls that let you control the Reverb/Delay added to your recording. This is important because once again we are recording with our iOS mic which records in mono. Propellerhead designed this app to work specifically with that scenario though and engineered the app to maximize the quality of those recordings. Of course what would an app be these days without ways to share our musical explorations? FaceBook, Twitter and email all are covered here as well as sending through a message. This is a beautiful looking app and joins a fine family of Propellerhead apps on the app store that you need to check out! Figure ($0.99) – builds some great 3 part music. The tag reads, “Got 3 minutes to make some music?” If you don’t have this yet it’s a ton of fun! The kids love it because it is so easy to get some pretty rocking music out of! 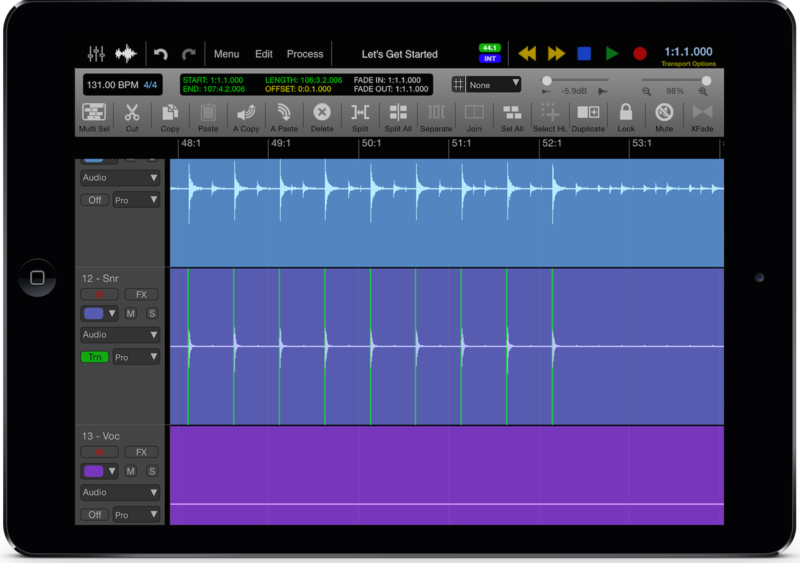 Thor Polysonic Synthesizer ($15) – one of the best synth apps out there. Professional Musicians helped develop the app settings and they also created guidelines for recording each instrument that you can read in the app. Allows you to share via email, Wi-Fi, iTunes files haring, DropBox and my favorite for students, SoundCloud. Are you looking for a way to run sound for your live performances that will make your life easier? Are you in a situation like us where it never seems like there is a person to run the sound for the show? Mackie may have the answer for you…. 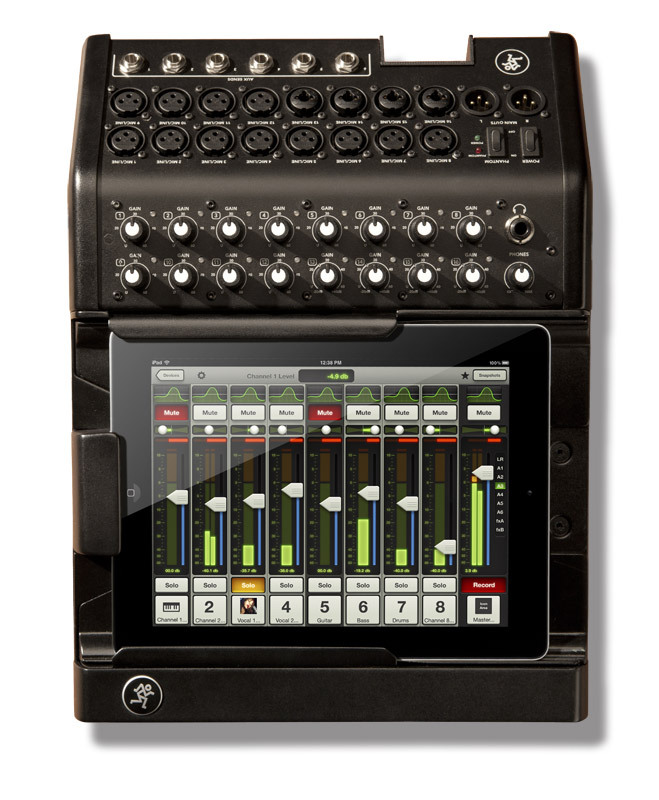 The Mackie DL 1608 or the DL806 are two sound boards that incorporate the use of an iPad to make running sound so much easier! 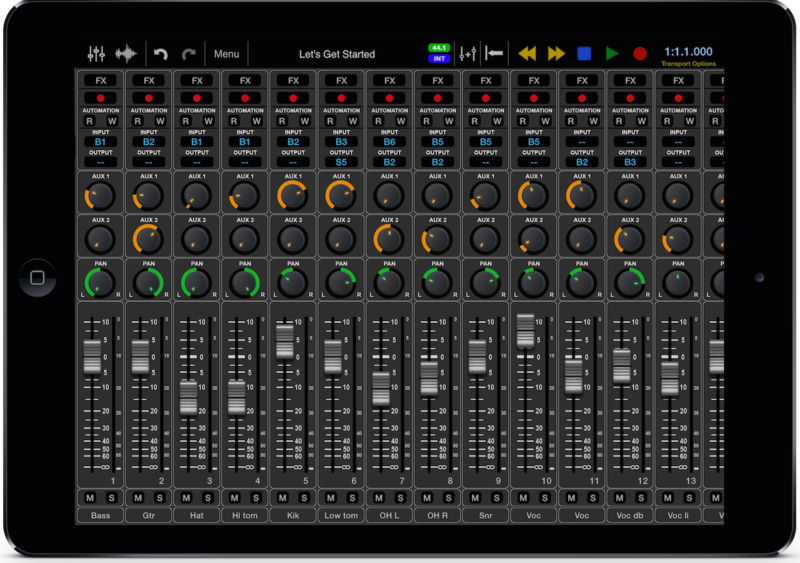 The mixer has a space built in for you to slide your iPad right into it – the iPad then becomes the interface for all the controls on the mixers. 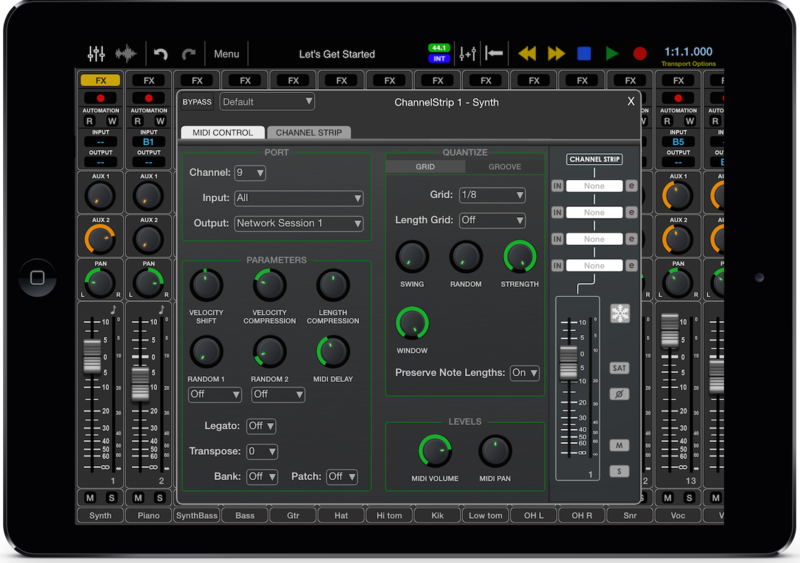 In fact, you will not see the typical array of sliders and knobs that would normally be on a mixer because most of those have disappeared into the iPad. Remember though that the handwork of processing the mix, eq’s, compressors and limiters is still actually being handled by the mixer itself. Here is the part that will blow you away… The iPad does not have to be docked to run the sound! Slide that baby right out of the dock and take the iPad where ever you want and the show will continue just like you were sitting back there in the back of the room like a normal sound person! That means that for those events when there is no sound person…. you simply hand the iPad to a student sitting in the front row playing clarinet, they run sound right from on stage. Maybe you run sound for the choir teacher but do it while you are sitting with your spouse in the audience. Now, you do get a few additional features if the iPad is docked – the iPad will charge while running the show and you will be able to record the stereo main outputs. Which means, as soon as the show is done you can upload those recordings to the school website for the kids to review. Check out the videos they have on YouTube – some are strange so be warned now, it IS Mackie we are talking about here! Getting Students Excited About Playing Music – How? First and foremost is the need for students to have access to professional musicians that are amazing teachers that are excited about passing down their musical skills to others. Second – One of the critical parts of our students getting better is the obvious fact that they need to PLAY and NOT just during class time. If they are going to be convinced play then they probably will want to play music that they like! My daughter is a prime example of this…. she looks up music on the internet all the time and then loads up a YouTube karaoke track to play along with it. Now, let’s be straight here…. the “music” she usually finds is just a bunch of A, B, C,’s where someone has written down the note names and threw them up on a website. WHO CARES!? She’s practicing her flute and making a ton of progress in the meantime! Third – Another critical part of convincing kids to play their instruments outside of class should be obvious…. Its way more fun to play music with others. Or at least with this rocking karaoke track or to create a backing track yourself and then play along with that. I found a trombonist tonight that is using technology to his advantage, now granted he has had a TON of instruction from some amazing professionals. Christopher Bill has taken pop tunes, learned them – the melody and accompaniment, then arranged them into ensembles and lastly recorded himself performing these songs. Of course technology plays a huge part in this process. Tech to record himself, then tech to promote those recordings. Now he has 39,436 followers on his YouTube channel and his version of Happy by Pharrell Williams has over 1 million views! What if we could get tech into our students hands that would allow them to create loops like this? Would it make for a more engaged student? LoopyHD ($3.99) is an amazingly simple to use iPad app that also works for iPodTouch and iPhone. What if our students started writing out transcriptions of songs they knew using apps like NotateMe ($34). This way they would actually be writing music out by drawing the musical symbols themselves. Using an app like SymphonyPro ($9.99) or Notion ($14.99) would be an awesome way to get their ideas into a nicely formatted and printed pieces of sheet music too. Then they could come back to school and pass the parts out to their friends, in the correct key for their instrument, and perform with a group of live musicians. Hmmmmm…… These are apps costing a fraction of what music professionals have been paying for Finale and Sibelius for years – those apps cost $250-$500 for a normal computer! How much more “in reach” does an app have to get to grab a kids attention and get them started being creative! Here is a link to the Breakthrough album by Christopher Bill on iTunes.